Your dog deserves days filled with love, fun and socialization! At Dogtopia of Bloor West Village, we are here to provide it all when you can’t. 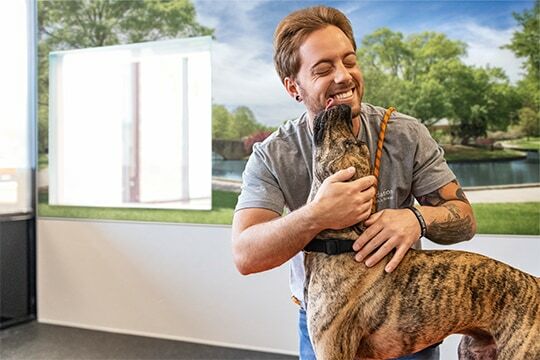 Our certified Canine Coaches treat your dog like family and always ensure a safe environment where your pup can play with their BFFFs (Best Furry Friends Forever). Your pup will enjoy stimulating play, off-leash freedom to exercise, and valuable socialization that will translate to better behaviour at home and around others. At the end of the day you will pick up one tired, yet happy pup! 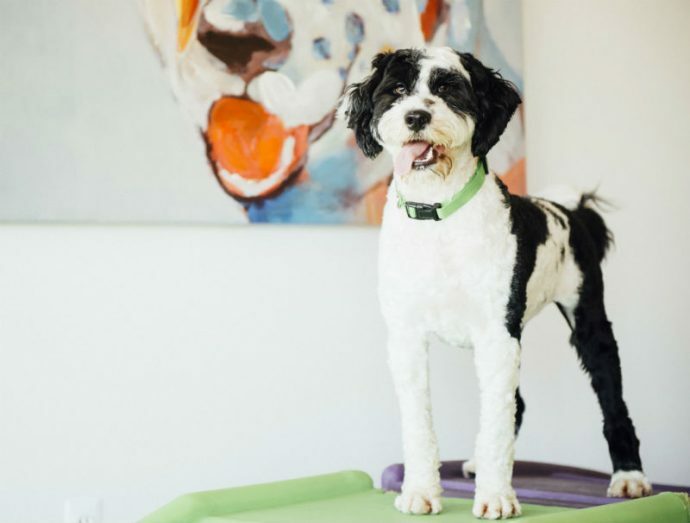 At Dogtopia of Bloor West Village, there is so much more to our daycare than just providing a safe and fun place to drop your dog off at while you’re at work. We treat every day like it’s the most exciting day ever! Our off-leash and open-play environment is a place where your dog will feel safe and loved while learning valuable socializing skills. We offer four spacious playrooms (the Toybox, the Lounge, the Romper and the Gym), where dogs are separated based on size, temperament and play style to ensure every pup is safe and comfortable. As your dog gets older and grows, they may be transferred to different playrooms as their confidence builds and their play preferences change. 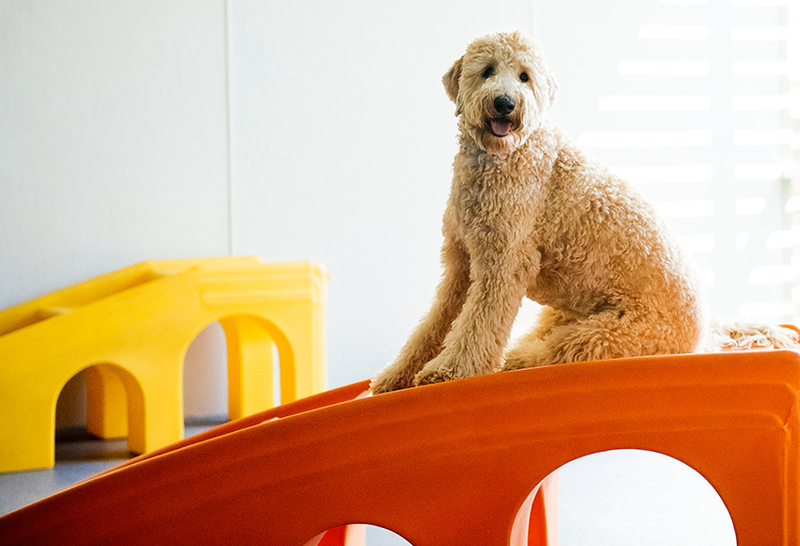 Our playrooms were designed with your furry family member in mind. Each of our climate-controlled playrooms are fully equipped with their own HVAC system with a specialized Atmos Air Filtration system that helps to eliminate airborne particles and circulate fresh, comfortable air. 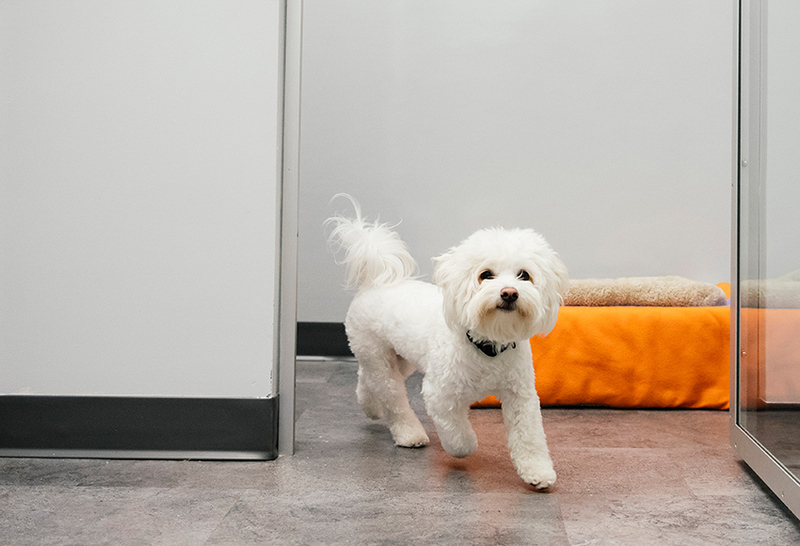 You will also find rubberized flooring throughout to ease your pup’s paws and joints. We frequently sanitize our playrooms during the day with pet-safe cleaning products that are both friendly for your dog and the environment, and deep clean at the end of the day. Our team of certified Canine Coaches has extensive training in a custom curriculum designed by a registered animal behaviourist and are proficient in dealing with dogs of all temperaments and breeds. They are trained to read doggie behavior and body language. 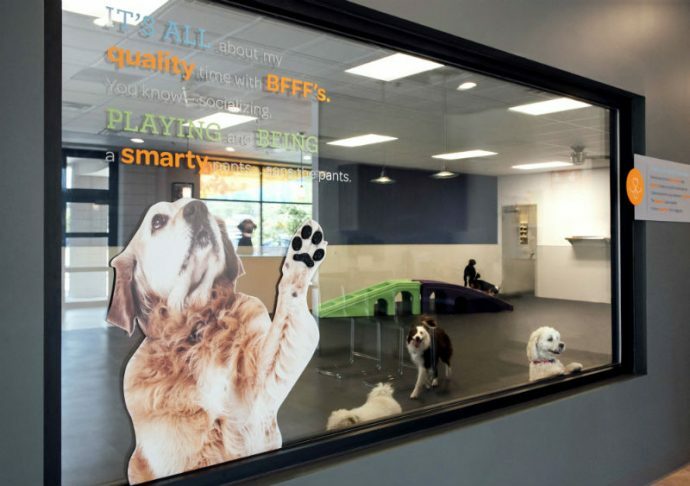 We aim to keep your pup entertained, socially engaged and educated. They’ll learn valuable socialization skills which will teach them to behave properly around humans and other dogs. Overall, we strive to help you raise a healthy and well-rounded pup! We believe in continually investing in our Canine Coach so they are up to date on the latest dog knowledge and best practices. 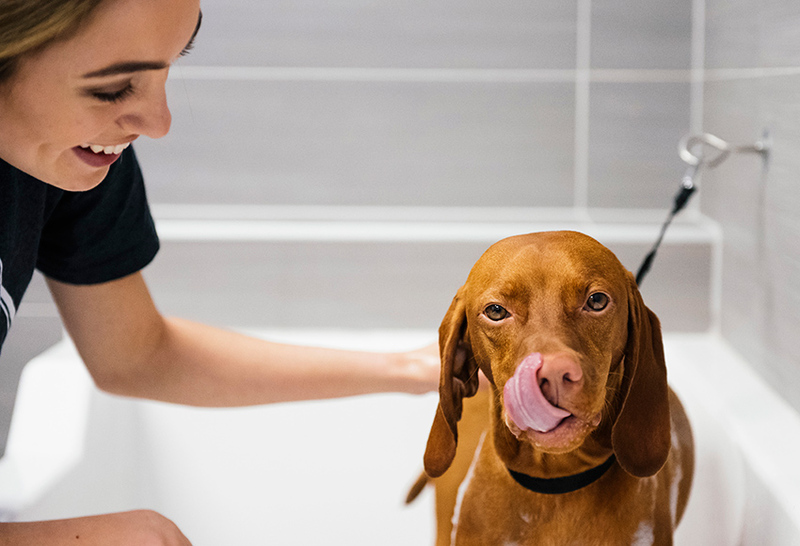 Our certified Canine Coaches care for your dog like family and keep you informed on their progress and behavior through periodic report cards with updates, including details of your pup’s favourite activities and tips to continue their training at home. Dogs aren’t the only ones to experience some separation anxiety which is why we have live webcams in all four of our playrooms which are accessible during play hours. You can check up on your furry family member and watch them play and romp around with their BFFFs! Dogs thrive on consistent routines and this is a great way to implement one for you and your pup. By creating a structured daycare schedule, your dog can expect to see many of the other pups regularly which will help them build bonds. Excited to get started? Before their first daycare visit, we require you to bring them in for a Meet and Greet with our team. This will give us a chance to get to know your furry family member and help us determine if our off-leash, open-play environment is the right fit for your pup. Book your dog’s evaluation by either filling out our contact form or calling (437) 317-4380. We can’t wait to meet you! Afraid of commitment (for now)? We’ve got you covered! We offer flexible passes to suit any budget or frequency. You can even use daycare passes towards your boarding stay. Passes have a one year expiry.